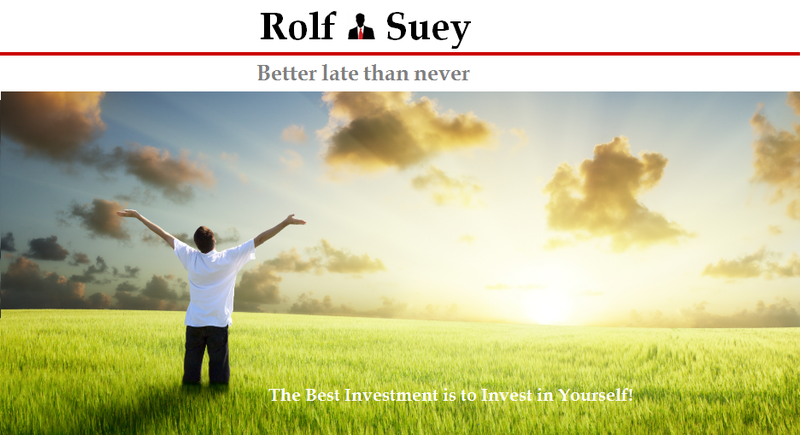 Rolf Suey - Better Late Than Never: Managing Things You Can’t & Can Control? In my preceding post, I cited my sardine-packed schedules for the past two months. I confess it is unhealthy for me both physically and mentally. To slacken the tension, I already applied for a week's leave this month. I am enthusiastic and look forward to it. I am also anticipating quiet months ahead in work. Guess in life there are bound to be times where you will be so busy. If it’s not at work, it can be time when you are getting married, getting your new house or having your first child so on and so forth. In my case for the past months, it’s more related to work. For instance, if my overseas clients need to conclude a sale urgently, I cannot tell them to wait for another month just because I am already very busy. Yes, I can. The consequence, a lost order! I also cannot tell the overseas colleagues not to visit Singapore nor can I tell the Networking event organiser to change their dates for me. It also does not make sense for me to tell my friends and relatives to reschedule their weddings or baby showers, can I? Yes, I can choose not to attend and just give a lame excuse for the absence. But is this sincerity? Likewise I also cannot just tell my kids school not to have school holidays in June. Similarly I also cannot tell my helper to reschedule her July trip home when an air ticket was already booked way in advance. If we cannot change something, we learn how to manage it. It is not just about managing the busy schedules, but more importantly the managing of our own thinking and actions / reactions! It is fundamentally important to adjust to the right state of mind and stay positive. I already mentioned in my earlier post and shall not elaborate further. I recognises that people are often more frantic than their busy schedule itself. Some people rushed for everything…meals, transport, meetings, emails, even toilets! Even when they talk, they rush! That is not all. They will get uptight, panicky and start to fume and fret over the slightest things that go wrong. Sounds like me also!!! – Haha….I am not an Angel, learning also. So stay calm, relax and stay focus! Never rush into things for it will only get worst with mistakes, wasting more precious time. What we need is urgency and initiative. Talking in a slower and confident tone or manner helps too! As I mentioned before, I will never miss a meal. I will rather miss a not so important meeting! I remember there was once a Chinese agent of mine suggested that we should skip our lunch and slot one more unintended casual client meeting. I agreed, but I suggested to him if we can find some place to grab a bread or bun, it will work well for me. He told me, we do not have time for that. I smilingly told him "you can meet the client yourself and I will go find myself some lunch!" If you think the busy traveling was already terrible, the worst is when emails kept flooding your computer and smartphone. A colleague will call, did you read my email (unimportant and not so urgent) when I was outstation traveling or in a meeting? Most of the time, I will say No, and will ask him/her politely to tell me what’s going on. So did I read emails while not in office? Yes I did if I have the chance and if it is really urgent. For most time, I prefer to make a phone call which is more efficient than the electronic mail response. Either in hotels or traveling, or over the weekend, I will try not to reply email. Of course it is easier said than done, depending on your boss or company culture. I urge you to “Try”! Some may ask "You are already so busy, why don't you work in the airport, or on the plane to clear some work? Why do still further pack your schedule by going to gym or read or blog in between all the hectic travel?" It is nothing of sort that I want to prove that I am a super-multi-tasker. Counter intuitively, the ability to cater time even during the busiest periods, for things I enjoy doing will help to rejuvenate my mind and body rather than further disintegrating it with more emails or work. Just like a re-chargeable my iphone each night….I also need to be re-charged! Furthermore, the benefits of exercising and perspiring will work wonder to the overall state of mind after a long dreadful work day. The busier you become, the more you need inner peace. 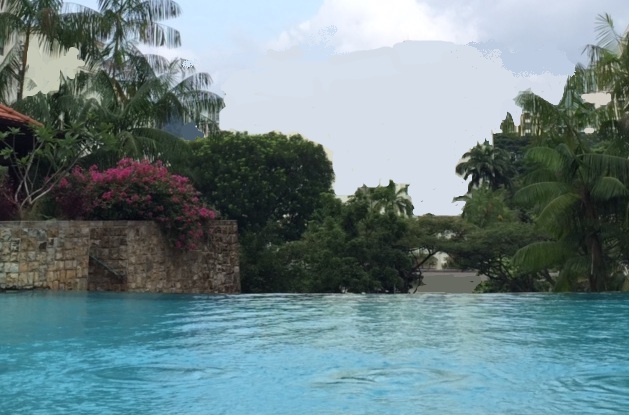 I am fortunate to stay near a nature reserve and have a beautiful pool at my vicinity. After a long hectic work day, it feels great to jog/dash to the greenery to enjoy the tranquillity of nature - the hill, the river, the trees, the fish and even the mosquitoes (non-aedes, please)! Alternatively, I will immerse myself into the swimming pool, which has a feature of water falling at the edge of the pool. I love to listen to the gushing sounds of water here, imagining it to be the nature's waterfall and indulge in its serenity! While on the plane, I enjoy being alone, as this is the time when I can really have peace and do the things I like, read newspapers, drink, movie, food, blog, read book etc. It may not work for everyone, but it works for me. I always believe that if you are well-dressed or at least stay presentable, you will naturally also feel good about yourself. By looking and feeling good, you can spread this “goodness” to the people around you as well. Busy times do happen in life. It is inevitable and things you cannot control. Learn to accept instead of fuming and whining. Recognise that it is only temporary and stay positive. Tell yourself that if you cannot even overcome this temporary challenge, it will be a challenge by itself in your life. 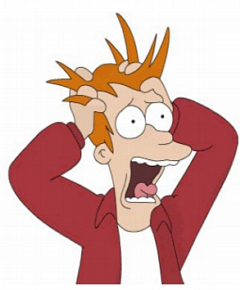 Our reactions to ungovernable things that happen to us and we can take control of our money (if we want to, that is). But then sometimes not being in control is the most beautiful thing in the world as it is also the source of change. Relating to money, glad to hear that you are taking control of your own and not your wife taking control of your money! Haha. Have to agree your point of not being in control. I add "not being controlled" maybe as equally important and also the ability to "Let it Go" just like the famous children song. Seems like your Chinese agent never take good care of you! Asking you to go without lunch and not offering to buy bread some more... really want to work you like mad huh? Indeed he did not. I probably need to take care of him on the contrary. Haha. Guess I was more experience about China in general than him since China is big and he is still new in the industry and only spend most time in the north. Anyway he was removed from his company not long later, from a series of stupidity act and bad interpersonal relationships among colleagues, I heard. I had a discussion with his superior, and we identify his problems as inexperience, eager to get sucess, lack of humility and like to "blow cow!" Hope he learn from his lesson.